As my regular readers know, I love it when I come across people and places with strong ice cream connections. One place I wrote about last year that seems to abound with ice cream kiosks, ice cream parlors and large ice cream display cones is Zandvoort, a delightful beach resort in the Netherlands. Zandvoort beach is one of the best along that coastline. 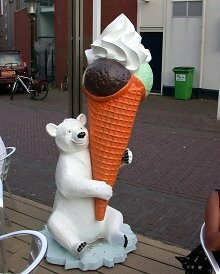 One of the best ice cream display cones I have ever seen was there - a smiling polar bear holding a giant ice cream cone of chocolate and mint choc chip ice cream! Read more about the bear and where I found him on my big ice cream cones post. If you ever get the chance to visit the Netherlands, especially in the summer months, then Zandvoort is a great place to visit for a day trip or weekend. 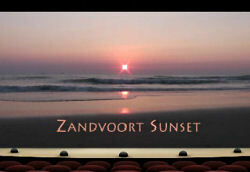 The reason for writing this post is that I just came across a fantastic video of a summer sunset filmed on Zandvoort beach. It's a wonderful, relaxing piece with a soundtrack only of what was happening live at the time - the natural sounds of a busy summer's days coming to a close (during which no doubt many an ice cream cone had been eaten!) and the gentle sound of the sea lapping up onto the beach. This kind of thing is what makes the Internet so enjoyable and such a positive means of sharing good experiences. Let's have more please!